Turns your computer into a modern, State-of-The-Art spectrum analyzer giving you features that go far beyond the possibilities of any stand-alone hardware unit. Multi Mode Support. Switch between 4 Stereo Devices easily with the Keys. Wave recording for the line in and the mic input Mp3 player to analyze Mp3 files (Mp2, atx) Two Peak Level Labels that give you control of the highest amplitude Peak hold option Generator leveling calibrated to1/100 of a dB. The Correlation Meter provides information about mutual phase-frequency relations between the signal of the left and right channel and allows us to spot any possible irregularities. These 'irregularities' may not have any significance in the case of stereo playback, but it should be remembered that the material we record can also be played as a mono signal (for example, on TV or on one of the radio stations which are broadcast or received in mono). We can not emphasize enough how important it is that your final mix is as close as possible to your intended mix. Of course you will have to spend some time with the program to learn how to read the indications of the correlation meter. Correlation with percentaged values. In this Settings dialogue all parameters of the correlation settings are to the user for individual attitude at the disposal. Here the time constant for the averaging of the correlation criterion is stopped. In the example shown above 6 values are averaged and spent then. With the next run the last value is then overwritten with the new. 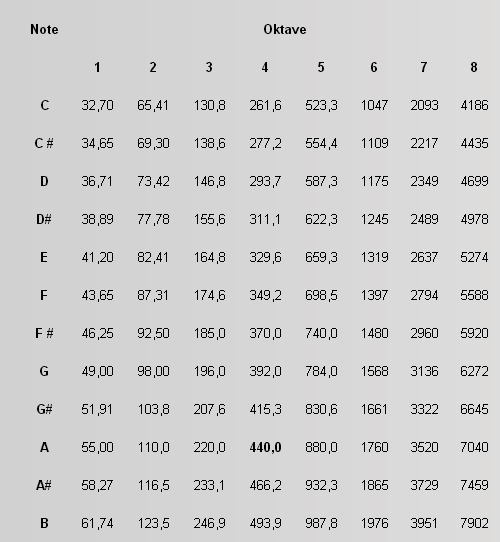 The adjustment possibilities are enough from 1 to 49. Consider thereby that high values are to be read off beautifully slowly, but fast changes of the correlation degree in the announcement are lost. Here you can stop the time periods, in which the next in each case measured value is switched to the announcement. The Eq suggestion provides equalizer settings on a 1/3 octave equalizer that will optimize the sound under "ideal studio conditions". Eq suggestion provides settings for the Equalizer faders to make the Sound (Input) linear. The SA will allow the user to actually observe the holes or the overlevels(highs and lows) as a function of frequency. The user may easily copy the fader settings to an actual 1/3 EQ hardware unit. Minor adjustments may be necessary as this process does not take into account any of the natural acoustics that are inherent and unique to each studio or listening area. 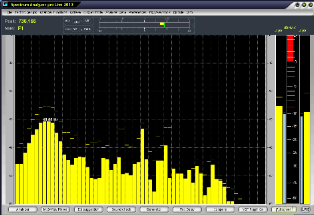 If the user saves the results from Eq suggestion, then loads the file into the Graphic Equalizer 2.0, the data will set up the EQ automatically. The Wave Player allows you the opportunity to load a pre-recorded Mp3/wav files and run an analysis of the data. All data contained in your sampling will be shown. Any changes made to the sampling rate will be automatically detected by the Spectrum Analyzer. The Locator is very practical when you work with big Wave files. The built-in generator allows the correct calibration between Analyzer and the line-in signal. Generator leveling calibrated to 1/1000 of a dB. You can load a frozen Spectrum as Background for better comparisons.Opportunity to select three various colors to make clear the difference amplitudes.